Following the success of last years campaign, over 100 Bournemouth businesses are uniting to bring back the Love Bournemouth Bunnies competition, with a new augmented reality twist. The popular Love Bournemouth Bunnies hunt and prize competition is returning for Easter 2018. 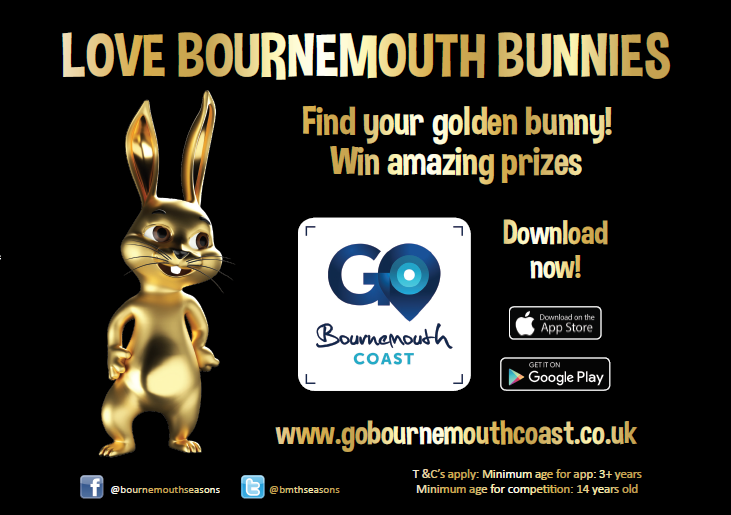 Providing a fun and interactive activity, the prize competition will encourage local residents and visitors to hop, bound and bounce across Bournemouth’s coastal areas in search of over 100 golden and virtual bunnies. Last year, hundreds of people took part in the competition, which encouraged participants to locate and take selfies with golden bunny statues situated in local businesses. With even more businesses involved, the new competition challenges families to explore Bournemouth’s coastal areas and find as many bunnies as possible between the 15th March and 9th April 2018. To find the bunnies, participants will need to watch out for clues on the Go Bournemouth Coast app, plus Bournemouth Seasons and associated business social media pages. Part of a number of locally planned Easter activities, the Coastal BID will also be bringing fun Easter Weekend events to Boscombe on the 31st March and Southbourne on 2nd April. This will include children’s entertainment and a giant golden bunny in Southbourne to celebrate the season.